Dr. Phillips (first name unknown) is a doctor at Cedars of Lawndale. 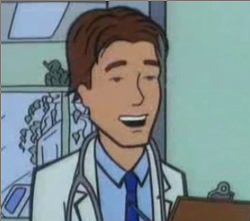 He appears only in the episode Ill, where he treats Daria. From his brief appearance, he seems to be a calm and insightful man, quickly recognizing that Daria's own family are sources of stress to her and tricking them into leaving the room. (He and Daria play gin rummy while he asks her "What is it with your mother?") As he tells Jane, she must be a friend and not family as Daria's "happy to see you". After days in hospital, he diagnoses Daria's rash as caused by stress. He also appears to be fairly young, and both Jane and Quinn seem to find him attractive - to his detriment as Quinn keeps wanting to talk to him. At the sight of Mrs. Sullivan's room, he shudders in horror. This character was later developed into Hanley Phillips, an AU-character, who previously served as a sniper and First Lieutenant in the US Army.